The first challenge you'll encounter in climbing large trees is rope placement: How do you get a rope over a branch that is 50 feet up? Answer: You attach it to a throwline and pull it up and over. And how do you get a throwline over the branch? You attach a throw weight to it, and throw it. 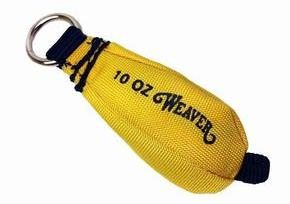 The throw weight is a “beanbag” ranging from 6 to 16 ounces in weight. The throw line is a 1.25mm to 3mm polypropylene or dynema line, which is usually 150 feet long. A skilled climber can lob such a line over a branch 70 feet high. Use an 8-10 oz. throw weight for the thinner throw lines (1.25-2.25mm); use a 12-14 oz. bag with the thicker lines (3mm). Heavier weights are used for trees with rough or flaky bark. Adventurous climbers usually like to climb the larger trees or taller trees. Professional climbers seek the highest fork in the center of the tree. Two tools can be used to get a line placed over these high points. 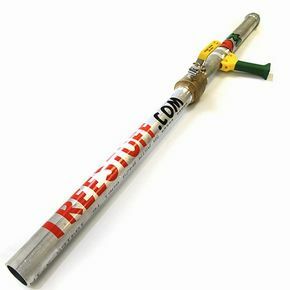 Big Shot Slingshot by SherillTree is a large slingshot head mounted on an 8-foot fiberglass pole. The throw weight is attached to a line that is usually over 200 feet long. To keep the line from getting tangled, use a throw line cube (or stack your line on a tarp). Always shoot with the throw line in front of you or risk getting a serious cut on your ear as the line goes out from the ground. Air guns are the newest technology for high line placement. They use compressed air. Up until recently these air guns were homemade. They are easily made with plastic PVC parts. But now you can buy one. You can dial in the height of the shot by looking at the air pressure gauge. This is really important because overshooting a tree usually ends up with a hung weight up in the tippy top. Make sure you bring spare lines! They are not a firearm nor bow and arrow. This can be helpful in restricted areas. They are fairly accurate. Some people mount a laser pointer on them. All you need is a bicycle pump. Floor mounted pumps are best with a pressure gauge near the handle. 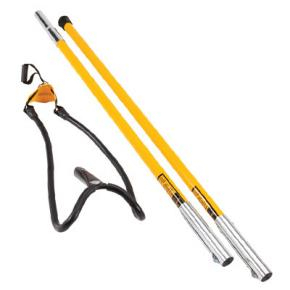 Bicycle frame pumps can also be used if you don’t mind the exercise. They make a very loud thump when they go off. It’s fun! Cheering is allowed. Beware -- Big Shots and air guns are not toys! Here are some of the injuries. One climber had his ear sheared off when he put his throw line cube behind him while using a Big Shot. A climber sent a throw weight through a door and a concrete block wall while fooling around with his air gun. Climbers get hurt when weights misfire and get hung up in the latex rubber band. Always wear safety glasses! A climber accidently stepped on the throw line while shooting with a Big Shot, resulting in a giant black eye when the throw weight came back at him. Safety glasses saved his eyesight. See "Gear Rater" ratings for LINE PLACEMENT GEAR.